Way back when Pokémon HeartGold and SoulSilver was announced in Japan it also turned out a special Pichu was being released for Pokémon Diamond, Pearl and Platinum owners to download. 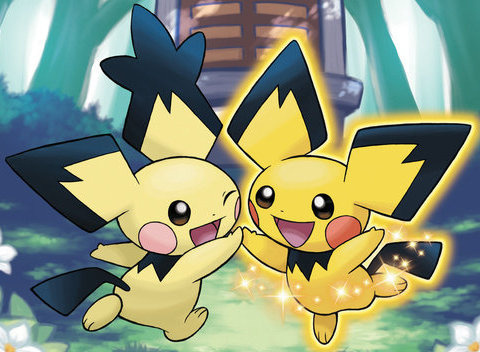 The li’l fella is transferable to HeartGold and SoulSilver and will trigger an event to unlock another special Pichu in those remakes, due out in March. Now it’s been announced that the funny coloured critter is making his way to GameStop in the US and to an as-yet-to-be specified event or retailer in the UK. US Pokémon trainers can claim the Pichu starting from tomorrow until Valentine’s Day. He comes in the event-only Cherish Ball, with special attacks Volt Tackle and Endeavour and even holds an Everstone that keeps it as a Pichu unless you yank it off him. We at Nintendo Life are still wondering what happened to "Pikablu" (a rumoured Pikachu variant from the original Gold and Silver that turned out to be Marill), but Pikachu and Pichu fans should squealing with joy at the extra cuteness coming their way in the coming months! I'll have to let my brother know. He loves Pokemon! Raichu is still the cutest of the 3. Guess I'll grab one when I head to a GS. I still wish they used the Mystery Gift Wi-Fi feature for this stuff, kind of ridiculous they didn't. YAY another event i cant go to because i dont live in the united states. I hate Pokemon. Good for those that like it. You mean that Pichu isn't Pikachu colored? I never knew that, seriously! @Iz2010 It unlocks the notch-eared pichu in HGSS. Can't be traded or evolved. Iunno I think this is kewl. I have a lil soft spot for Shining Pokemon. Guess its just the Shrek in me. How can I get it in Platinum?? Not a huge Pokefan, so this seems kinda lame to me. Pikablu was simply a popular fan translation (because Marill looks a bit like Pikachu and didn't have an official US name at that point) that made it's way into a couple of official sources such as the trading cards by mistake. Anyway wheee, been waiting for UK news of this event. I'll probably grab one if there's any nearby where I live. You mean this whole time, Pichu was faded?!! *****!!!!! Why can't you get this via online? Why just GameStop? While I find "catching 'em all" an ever elusive yet engaging quest, I just can't get into all the shiny, special colored, funky shaped variants of normal pokemon? When is it too much? It makes me long for the days of Pokemon R/B/Y and the elusive 151st pokemon Mew. There's just too much you can't get in the game itself nowadays. Of course, back in my day, you had to walk 5 miles in the snow, uphill both ways to get to gamestop just to get that mew, so you appreciated it more. Got my Pichu today! Both on my Diamond and Platinum carts! Woot! Well, at least it gives me some extra motivation to preorder it. @bluecat: He was probably referring to the upcoming Jirachi event. @TwilightV - Ohhh I hope so! Thanks!